Specialty retail in Ashland is heavily weighted towards independently-owned businesses. Ashland merchants provide specialized service to their customers hand-selecting merchandise to offer unique products both in-store and online. Retail merchants support numerous local charities, youth sports and school groups throughout the year and are engaged in the community. The size and the buying power of Ashland’s markets impact the types of businesses that choose to locate in Ashland. The chart illustrates consumer and retail expenditures by category. Consumer expenditures in Ashland, including household, tourist, and business expenditures, totaled over one billion dollars in 2015. 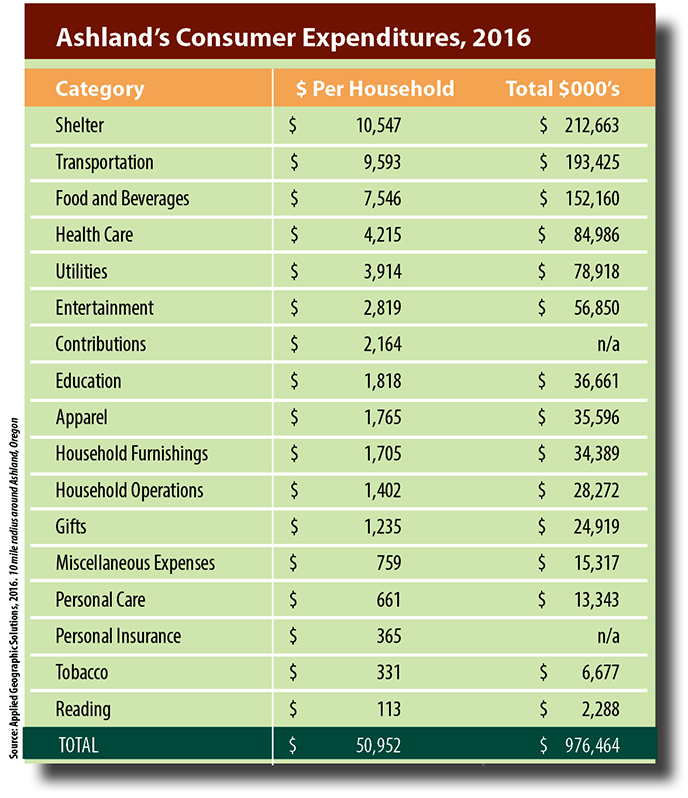 The categories with the largest expenditures included shelter, transportation and food and beverages.